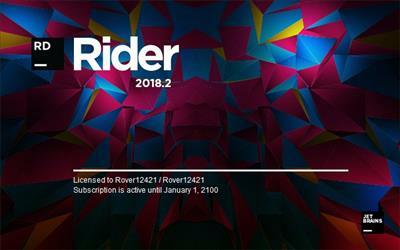 JetBrains Rider 2018.2.3 (x64) | Free eBooks Download - EBOOKEE! Posted on 2018-09-14, by voska89. JetBrains Rider is a new cross-platform .NET IDE based on the IntelliJ platform and ReSharper. Rider lets you open, edit, build, run and debug most kinds of .NET applications: desktop, web, libraries, services (with a notable exception of UWP applications). Applications that target Mono, such as Unity and Xamarin, are also supported, as well as the latest and greatest .NET Core applications. Rider uses UI and multiple features of the IntelliJ platform, which powers IntelliJ IDEA, WebStorm, and other JetBrains IDEs. It's cross-platform, familiar to millions of developers, and provides core functionality such as VCS and database support. On top of that, we add ReSharper features: navigation and search, refactoring, code inspections, quick-fixes, and so on. We have spent 10+ years building a feature set that helps read, write and navigate large .NET codebases, and all this is now available to Rider users. Rider isn't jammed into a 32-bit process, which helps it gain deep insight into your code while still being responsive. Rider opens (and reopens) most solutions with almost zero latency. External changes to solution? Switching Git branches? Not a problem: Rider catches up quickly. When you edit code, our topmost priority is to make sure that you type as fast as your fingers are trained to, not only as fast as the IDE can process your input. Rider provides tons of smart code editing features, such as different kinds of code completion, auto-importing namespaces, auto-inserting braces and highlighting matching delimiters, rearranging code, live and postfix templates, controller and action hyperlinks in ASP.NET MVC, a multi-selection mode, gutter icons for inheritance navigation, as well as quick access to refactorings, generation, navigation and context actions. Rider boasts 2200+ live code inspections to help you detect errors and code smells. Over 1000 quick-fixes are available to resolve detected issues individually or in bulk: just hit Alt+Enter to pick one. For a bird's-eye view of errors in your projects, use solution-wide error analysis (SWEA): it will monitor errors in your code base and let you know if anything goes wrong, even you don't have a problematic file open in the text editor. Jump to any file, type, or member in your code base in no time, as well as find settings and actions, all with a common Search Everywhere shortcut. You can find usages of any symbol, including cross-language usages and usages in string literals. For contextual navigation, use a single Navigate To shortcut that will take you from a symbol to its base and derived symbols, extension methods or implementations. Want to know how third-party library code works? No problem with Rider: just use Go to Declaration on a library symbol, and have Rider decompile the library type to C# in a regular editor tab. You can then navigate decompiled code as you normally navigate your source code, as well as find and highlight usages. Sometimes however, decompiling is not even necessary: Rider can fetch source code from source servers such as Microsoft Reference Source Center. Windows 10, 8.1, 8 or 7. 64-bit distributions only. No comments for "JetBrains Rider 2018.2.3 (x64)".